A smile worked wonders for a little Pug/Terrier mix named Princess, who was listed on Petfinder by Kritter Kamp Rescue in Elk Grove, California. It gained her a home. Mimi shows her zest for life. 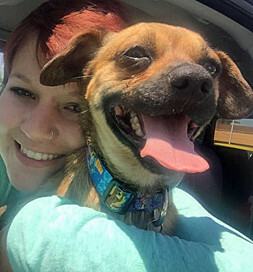 Chandler Hayden had been looking for a dog to adopt for several months, but when she spotted that winning smile, she knew this was the one and contacted the shelter about adopting the dog. “She just looked so happy to be alive,” says the Reno, Nevada, woman. She drove over 200 miles to meet Princess and wasn’t disappointed. The dog jumped right in her lap as if she had been waiting for her. The adoption was accomplished, and as they made the long journey back home, the dog cuddled up on a blanket next to Chandler. “The blanket had belonged to my grandmother, whom I called Mimi,” she says. “She was my best friend.” Her grandmother’d had love of life and a warm smile, too, so Chandler decided to name her new best friend Mimi. Mimi meets each day with exuberance. “She smiles when she goes on walks or gets to cuddle, and she does a happy dance when she sees her food bowl or her leash,” Chandler says. “She loves to go on hikes with others dogs, like my mother’s Labrador. She matches him step for step!” Chandler has set up one play date with a young pug named Bill Murray and hopes to get the two of them to a river park to play when the weather gets nice. At the end of the day, Mimi makes a snorting noise and burrows into the blankets for a night’s rest so that she’ll be ready to spread her good cheer when the new day dawns. She’s the best of dogs.